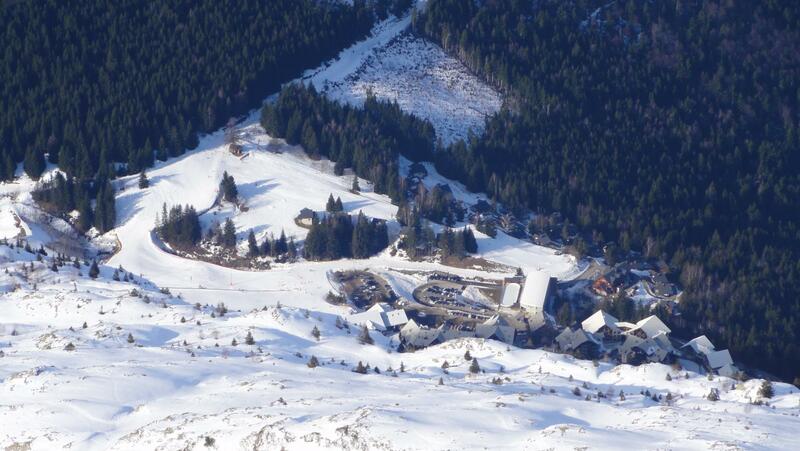 If the presence of the village and its hamlets goes back to the high Middle Ages, the site of Oz’s resort at 1350 m height, was blank of houses till the end of 1980’s. Composed of high mountain pastures, forests and rocks, it was frequented by the herds, their shepherds, and the walkers. Oz's history is confidentially connected to the history of the mountain climbing in the Oisans area. Oz became a major starting point for the ascent of “Peak Bayle” (3365 m) of the Etendard (3364 m) and of the Lac Blanc (3331 m) from the 1860”s. With the arrival of the ski, Oz also became a spot for the amateurs of ski touring, with one made uneven of more than 2000 m, from 3300 m to 1350 m.
The dream continues today, thanks to Oz's resort situated at1350 meters height. It benefits from the area of the ski slopes of the “Grandes Rousses – Alpe d’Huez Grand Domaine -” to which it brings new and secure slopes, reserved until 1989 for the only amateurs of ski touring and powder snow. Among the latest resorts of the French Alps, Oz so enjoys 50 years of experiment of development of resorts and provide to all his residents architecture and town planning carried by strong environmental and social politics. Between fir trees, not far from summits and certified rural resort, Oz makes every effort for the well-being of the family and the access to the protected nature which surrounds it. Whatever the age of the children, everything is thought to spend holidays of exception, from the snow garden to the swimming pool, via the animations, so that tobogganing and new glides. To charm of this "human-sized" resort which the architecture plays with stone and wood, the friendly, is added the festive and warm atmosphere of its pedestrian street lined with shops, which is transformed into ski run during winter. The middle of the resort is exclusively reserved for the skiers and the pedestrians. Ski at the heart of the resort - village and almost up to the door of your chalet “Oz-Sweet-Home"